Who Should Become a Police Officer? Anyone who has personality traits such as integrity, intellect and initiative could be a police officer. Departments look to hire officers who are honest and do not cross moral or ethical boundaries. They need people who are smart enough to handle the complicated nature of this job, think on their feet, make quick decisions under stressful circumstances and have the ability to deal with all kinds of people under testing circumstances. If you have the above mentioned traits, you may want to look into becoming a police officer. After determining whether your personality is a perfect fit for the job or not, you might be wondering ‘how do I become a police officer?’ If this thought has ever crossed your mind, then continue reading. The minimum level of education required is typically a high school diploma or a GED. A college degree, while not a compulsion, is certainly an added benefit and may appeal to potential employers. An associate’s degree or bachelor’s degree in relevant fields such as police science, public administration, criminology or criminal justice can help you gain useful knowledge and abilities for a career in law enforcement. The Entrance Exam: This is often called the “civil service exam”. This helps agencies pick out potential candidates by testing their basic communication skills. The Physical Ability Test (PAT): This test is designed to measure an applicant’s general health and fitness. It might require you to run a quarter mile or a specified distance in a specified time. Activities such as fence climbing, dragging a dummy, pushing a patrol car and running an obstacle course might be part of this test. The Oral Board: This is like a job interview. It takes place before three or more officers of varying ranks and basically determines how well the candidate can perform under psychological pressure. The Background Investigation: The Police Department is highly concerned with the candidate’s reliability and integrity. For this purpose, it performs an extensive background check that sometimes involves getting in touch with the applicant’s former bosses, professors, teachers, spouse, neighbors, family members etc. Credit report checking is also a measure of a candidate’s integrity utilized by the department as a check. The Polygraph Test: This test is used throughout the application and hiring procedure to check the applicant’s honesty. The Psychological and Physical Examinations: A psychologist will administer a written test and subsequently interview the candidate. His/her assessment is taken into account by the department when making a decision. The Executive Interview: After the department is done processing the candidate, another interview will be conducted. Typically, this interview will be taken by a high ranking officer within the department. After getting clearance from the department, accepted applicants are required to complete a rigorous training program. A typical police academy training session lasts about 12-14 weeks and combines theoretical studies with physical training. The courses studied covers subjects such as law and civil rights as well as police protocol and responses. Physical training involves self defense techniques and firearm usage. 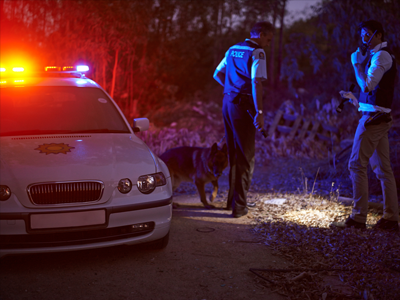 After you have cleared all tests and become a police officer, you might be concerned with what this career path holds for you. According to the US Bureau of Labor Statistics, the 2012 median pay for police and detectives was $56,980 and around 780,000 jobs were available for police officers in the same year. Job growth in this sector is highly correlated to the amount of government spending on public safety at both state and local level. The amount you earn at the end of the day depends on several factors. This includes the location, the agency you work for, your performance, skills and the amount of experience you have. With the right experience and training, police officers could choose their specialization such as narcotics or juvenile enforcement. Once on the job, you may switch between departments as well, depending on your relevant expertise and experience. Apply your energies to actively pursue opportunities by maintaining high performance. Promotions available to police officers include captain, lieutenant, detective and police chief etc. A variety of continuing education opportunities are available to police officers and taking part in these may assist in securing a promotion.